District Attorney Bonnie Dumanis announced Wednesday her endorsement for re-election by state Attorney General Kamala Harris. 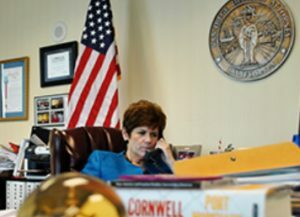 San Diego District Attorney Bonnie Dumanis. Dumanis is running for a fourth term. She faces ex-prosecutors Robert Brewer and Terri Wyatt. Dumanis has the endorsement of Mayor Kevin Faulconer, members of the county Board of Supervisors and Sheriff Bill Gore. The Brewer campaign acknowledges Dumanis’ endorsement by the union representing county prosecutors, but says more than 100 members of the Deputy District Attorneys Association voted to endorse him. Dumanis won the endorsement with 169 votes, according to the Brewer campaign. Brewer, now in private practice, has been endorsed by the San Diego Police Officers Association and Deputy Sheriff’s Association, along with groups representing officers in other cities around the county.